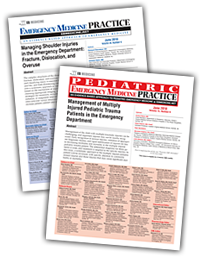 Your EB Medicine Premium Subscription includes full access to Emergency Medicine Practice and Pediatric Emergency Medicine Practice , which provide you with new issues every month, each focusing on the practical application of the evidence for topics like trauma, cardiovascular emergencies, drugs & procedures, airway management, and more. And every issue is written and peer reviewed by practicing, experienced ED physicians who care deeply about giving every patient the care they deserve. We take you step by step from the moment your patient presents to the ED with an often vague complaint, through risk stratification, laboratory testing and imaging, treatment, and disposition. Rigorous evidence-based research: Presented by renowned clinical leaders – giving you the confidence to adopt new best practices. Peer-reviewed quality: Each reviewer is chosen for his or her expertise in the topic. Recommendations you can trust: We never accept advertising or commercial support, and our expert authors and reviewers ensure independence and transparency in every article. Calculated Decisions: Links to MDCalc's clinical decision tools, and a jointly published supplement, Calculated Decisions, to guide your practical application of evidence-based calculators in the ED. Points & Pearls: a quick-read supplement to each monthly issue that provides subscribers with the key points and practice takeaways for that issue. EMplify companion podcast: Developed exclusively by and for emergency medicine clinicians, the EMplify podcast makes it simple to stay up to date while on the go. Up to 384 CME credits in the first year. You can earn CME credit for all issues in the next year plus from any issue published within the last 3 years! That's 96 new CME credits for the current year plus 288 CME credits from the previous 3 years. More practical clinical pathways than any other emergency medicine resource:These practical algorithms help confirm your decisions and improve patient care. We guarantee that the EB Medicine Premium Subscription will boost your clinical confidence, refresh your memory of the fundamentals, and keep you abreast of the most relevant updates in emergency medicine. Try it for 12 full months. If you feel at any time (even on the last day of the 12-month period!) that your subscription has not helped improve your quality of patient care, call us for a full refund, no questions asked. What do subscribers say about our publications? I subscribe to Emergency Medicine Practice, and Pediatric Emergency Medicine Practice. All of your products are, very simply, the best bang for my CME dollar on any basis of comparison. I'm very impressed! As an active teacher and busy clinician, I use your products every single day. Keep up the excellent work!" Concise clinical points and review. It's what I want to know in my EM practice. My #1 source of post-residency education." Accreditation: EB Medicine is accredited by the Accreditation Council for Continuing Medical Education (ACCME) to provide continuing medical education for physicians. This activity has been planned and implemented in accordance with the accreditation requirements and policies of the ACCME. Credit Designation: EB Medicine designates this enduring material for a maximum of 4 AMA PRA Category 1 Credits™. Physicians should claim only the credit commensurate with the extent of their participation in the activity. ACEP Accreditation: Emergency Medicine Practice is approved by the American College of Emergency Physicians for 48 hours of ACEP Category I credit per annual subscription. AAFP Accreditation: This Enduring Material activity, Emergency Medicine Practice, has been reviewed and is acceptable for credit by the American Academy of Family Physicians. Term of approval begins 07/01/2017. Term of approval is for one year from this date. Physicians should claim only the credit commensurate with the extent of their participation in the activity. Approved for 4 AAFP Prescribed credits. AOA Accreditation: Emergency Medicine Practice is eligible for up to 48 American Osteopathic Association Category 2-A or 2-B credit hours per year. Faculty Disclosure: It is the policy of EB Medicine to ensure objectivity, balance, independence, transparency, and scientific rigor in all CME-sponsored educational activities. All faculty participating in the planning or implementation of a sponsored activity are expected to disclose to the audience any relevant financial relationships and to assist in resolving any conflict of interest that may arise from the relationship. In compliance with all ACCME Essentials, Standards, and Guidelines, all faculty for this CME activity are asked to complete a full disclosure statement. This information is provided as part of the course materials. Commercial Support: Emergency Medicine Practice and Pediatric Emergency Medicine Practice does not accept commercial support.